3,283 points. 748 blocks. 18 dunks. 3-Time AP All-American. You know her name, get to know her stats. Brittney Griner. Over the past four years we’ve been privileged to watch this women single-handedly dominate basketball. Her presence electrified fans and disheartened opponents. Her voice in the media was not loud and boisterous, but her talents on the court were. We’ll never see Griner in all her glory on court as a collegian, but the future is bright for her. She now has the opportunity to set more records and be the best player women’s basketball has ever seen. With the opportunity for further glory come opportunities to become the face of the sport, redefine female athletes, and make millions. Her on-court prowess will afford her the opportunity to create a unique brand that celebrates her and encourages the celebration of female athletes. To best maximize her potential, Griner must choose her team wisely. When I say team, I’m not referring to her future WNBA team; but the management team that will help her traverse the world of professional sports. A great team can make Griner a successful businesswoman and basketball player. It can help her build a brand that influences the world and makes her a household name. The wrong team can lead her to bad business decisions and heartache. So Griner must choose wisely. In picking her management, she should keep three things in mind, and cut people from her team who don’t support her. Shakespeare wrote it best, “This above all: to thine own self be true.” If Griner can’t be herself when promoting herself or someone’s product, her promotion endeavors won’t be successful. To build a successful, long-lasting and profitable brand, Griner has to be believable to her fans and to consumers, and that’s not possible if she is pretending to be someone’s she isn’t. The media repeatedly promotes female athletes in a feminine, sexualized manner in an attempt to maintain gender norms of male dominance and female subservience under the guise of selling products. I’ve seen it happen time after time when an athlete goes from cornrows and sneakers to straight hair and heels to try to fit “the mold” and become more marketable. If Griner isn’t a make-up, stiletto wearing type of lady, she shouldn’t feel compelled to conform to be that (or anything that isn’t a reflection of her) just to improve her marketability. I’m not saying that Griner needs to be willing to put the feminist struggle on her back and change the way we view female athletes (unless of course she wants to), but she should be able to be successful being just who God made her. If her team can’t find a way to package her that is a both marketable and honest reflection of her; they shouldn’t be a part of her team. There’s an old saying, “All that glitters is not gold.” I hope that Griner either already knows or quickly realizes that every shiny person and every offer aren’t golden no matter how much they glitter. Otherwise she could find herself learning the hard way that shiny deals can obscure ulterior motives. Case in point: Mark Cuban’s recent offer to select Griner in the NBA draft. The offer to be one of the first woman ever drafted into (and perhaps play for) the NBA seems alluring, but a wiping off the glitter shows that this really wouldn’t be a stellar move for Griner. Participating in the NBA draft would demean Griner’s talents. Instead of basking the rightfully earned glory of being one of the best female players the sport has ever seen, Griner would unnecessarily be subjected to criticism that she isn’t strong, fast or good enough for the man’s game. Whether that statement is accurate is immaterial. Griner should not be compared to men. She’s a woman and a magnificent ball player. Such comparisons won’t elevate her, only tear her down and detract from her accomplishments. The one who truly stands to profit from Griner’s participation in the NBA draft is Cuban. The coverage and potential ticket sales that Cuban would receive at the expense of Griner’s legacy would be enormous. I suspect that Cuban’s offer as more to do with his profit margins and less to do with making Griner one of the most successful basketball players ever. Hopefully Griner surrounds herself with a team that can successfully assess the genuine and long-term effects of partnering with various brands and endeavors. My third point doesn’t come with a quote but it’s paramount to the success of points one and two. Ignore the Haters. Griner has plenty of haters. For instance, Griner’s success has been subjected to the cruel commentaries, from people who will never accomplish half of what Griner has accomplished in her less than twenty-five years on this earth, filled with overt sexism and gender biases that unnecessarily question her sexuality. Despite the ignorance, Griner has remained classy and continued to dominate in her craft. It’s imperative that she continues to ignore the incessant commentary. 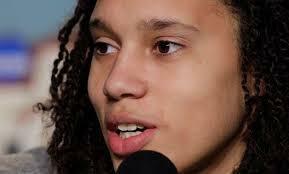 If Griner falls victim to the haters, she may feel the need to compromise in efforts to silence the hate. Griner must know that silencing haters is an impossible challenge. She’ll always have haters, so trying to please them will only cause her to lose herself. In selecting her team she should choose management that is equipped to ignore haters and think outside of the box. If Griner and her team feel pressure to conform she might tragically be convinced that compromise is a necessary evil on the road to success. Brittney Griner has the world ahead of her. She will have many opportunities and her success will be based on how true she remains to herself and how smart and creative her team is. I hope she chooses wisely. Shakespeare, William, Hamlet, Act I, Scene 3, Line 78.